Rafters float down the Delaware River in Westfall Township, Pa. on May 29, 2016. From any angle, the Delaware Water Gap is a monument to the forces of nature, so it is easy to overlook what humans have left in the dirt. In his 1983 geologic history of the region, “In Suspect Terrain,” the writer John McPhee described approaching from the east and seeing the arresting gap on the horizon, “as sharply defined as a notch in a gunsight,” cleaving the otherwise unbroken crest of the Kittatinny ridge. The Delaware River snakes through the gorge it carved on what is now the border between Pennsylvania and New Jersey and exposes patterns on the cliff walls that indicate how the ancient earth rose and folded. The recreation area also includes wooded tributaries to the Delaware, like Raymondskill Creek. A view of the Delaware River from the Cliff Park section of the Delaware Water Gap National Recreation Area near the northern end of the 70,000-acre park. John A. Punola casting for shad on the New Jersey side of the Delaware Water Gap in the Delaware River. The same scene encompasses a remarkable, representative chronicle of human life in the region, although its outline is less conspicuous. Remnants buried beneath the flood plains and the river’s terraces offer hints at the ways people lived and died during 13,000 years of almost continuous occupation. Admission: No fee to enter the recreation area. Fees apply at some river beaches and access points between April and October: $7/$10 per vehicle or $1 per pedestrian or cyclist age 16 or older. Hours: The park and the headquarters building are open year-round; some visitors centers, access roads and picnic areas are closed in winter. Check park website for schedules. 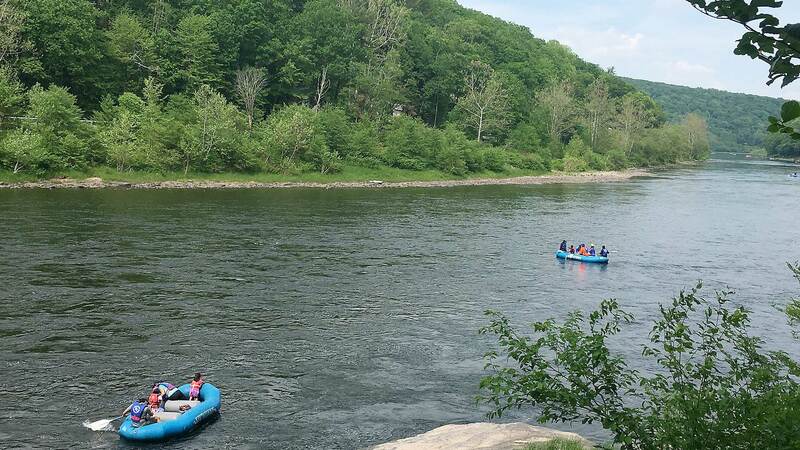 Special tips: The park is large and diverse with opportunities for boating, tubing, biking, hiking, camping, fishing, scenic drives and historical tourism. Hazards can include steep cliffs, swift river currents and wildlife. Accessibility: Many sites and activities are wheelchair accessible, including a boardwalk trail to Dingmans Falls, the second highest waterfall in Pennsylvania. Where to eat: At the southern end of the park, get a pot pie at Village Farmer and Bakery, 52 Broad Street, Delaware Water Gap, 1-570-476-9440. At the northern end, dine on the front porch at Hotel Fauchere or downstairs at Bar Louis, 401 Broad St., Milford, 1-570-409-1212. The park is largely confined to the river itself in a 73-mile stretch between Hancock, N.Y. and Matamoras, Pa., plus several public river access points and two historic sites: the Zane Grey Museum, in the western novelist’s former home, and John A. Roebling Bridge, the oldest existing wire suspension bridge in the United States. Fun fact: The Upper Delaware is prized for canoeing, fishing, river rapids and bald eagle viewing in winter. For nearly as long as there have been humans in this corner of the continent, they have left a record here. The park’s rich archaeological record is not obvious to most visitors, who numbered 3.7 million last year, making it the 23rd most visited National Park in the United States. It is possible to picnic on a lawn near the river bank and not know there are traces of an 800-year-old fishing village in the soil below it and probably evidence of older habitations deeper still. “People unintentionally and intentionally transform landscapes and everything on them, and are in turn transformed by those landscapes,” he said. The same thing that attracted the first people to the valley enticed everyone since. 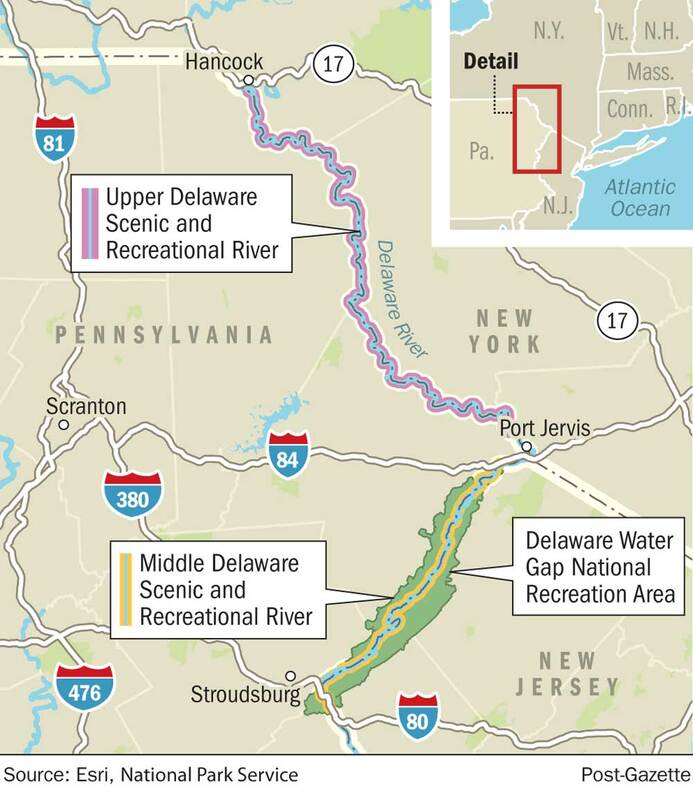 From the start of the Holocene to the arrival of European settlers, “you just get this repeated use of the river,” said Michael Owens, the cultural resources program manager for the Delaware Water Gap National Recreation Area. The flow of water has been constant, but the waterway and landscape have changed. People began to occupy these river banks not long after the glaciers retreated, when the river would have been a braided, muddy stream not the consolidated channel that today draws kayakers and rafters in droves. But water drew animals, and animals meant food. Around 13,000 years ago, Paleoindians hunted with spears topped with fluted rock points, called Clovis points, which were found about 9 feet deep in the 1970s during excavations just outside the park boundaries at a site discovered by a retired electric company repairman with a passion for archaeology. That site, called Shawnee-Minisink, helped establish the Upper Delaware Valley as a nationally significant archaeological area and helped scientists rethink how the first people in the region acquired food, Mr. Stewart said. At the time, Paleoindians were widely believed to be predominantly big-game hunters, but seeds and fish bones recovered from the site revealed evidence of foraging and fishing. “It helped to chip away at that specialized, big-game-hunting focus that had been attached to Paleoindian cultures for so long,” he said. Other research in the Delaware Water Gap area has contributed crucial information about each subsequent period of human occupation, like how and where Native American cultures interacted, when they began to cultivate plants for food or ceremony, and ways they managed their environment. Excavations of Native American burials in the Upper Delaware Valley began in the early 1900s and possibly earlier — a 1915 account of archaeology in the region already lamented the loss of artifacts to looting, Mr. Stewart said. Half a century of study and collecting, some of it notoriously exploitative, helped later professional archaeologists identify valuable sites that were imperiled by a 1960s proposal to build the Tocks Island Dam six miles north of the water gap, which would have flooded an area 40 miles long and a mile wide. Museum technician Lori Rohrer holds a piece of reassembled Native American pottery that was excavated near the Delaware Water Gap. Cultural Resources Program Manager Michael Owens displays net sinkers that native people used to weigh down nets to catch fish on the Delaware River. The dam project exemplifies a trend in the park’s cultural investigations. So much of what archaeologists know about the valley can be tied to waves of impending development that spurred researchers to dig up and rescue what they could. Eventually, plans for the dam were scrapped after more than a decade of preparations and thousands of residents were permanently displaced. But it inspired a period of intense archaeological study that uncovered dozens of important sites and trained a generation of scientists. Universities received contracts to survey the New Jersey and Pennsylvania banks of the river and conduct what was called salvage archeology, “which was just going to the known locations and saving what you can,” explained Lori Rohrer, the recreational area’s museum technician. Artifacts trapped at different depths of the layer cake of sediment that had been deposited over millennia helped distinguish periods of human presence and established better dating for distinctive pottery or projectile points. The findings, quickly published, provided an early framework for archaeological investigations throughout nearby states, Mr. Stewart said. “It impacts the way other archeologists in the Middle Atlantic region are thinking about prehistory,” he said. Today, intense archaeological research occurs much less frequently in the park and is usually prompted by some kind of planned or accidental damage — to take an account before a new toilet facility is installed or a power line crosses the park, or to recover artifacts brought to the surface by a farmer tilling a field that should not have been plowed. Even now, the park’s buried depths still produce surprises. About a decade ago, park archaeologists expected a survey to prepare for the building of a beach on the New Jersey side of the park to be unremarkable. Instead, the study exposed traces of a fishing camp from the late Woodland period, about 800 years ago, unlike anything that had been uncovered in the park before. Below the topsoil, archaeologists found a clear pattern of circular stains in the dirt, indicating spots where long-decayed saplings had once been anchored to make conical huts or wind breaks and fish-drying racks. The site, which contained few artifacts, speaks to the research value of the intangible. Among the remarkable traces was the outline of a grass fishing net, Ms. Rohrer said. “You couldn’t excavate it because the minute you pick it up it’s gone,” she said. In an ironic turn, environmental disruption in the park led to a new way to connect the region with the native people whose displaced ancestors made the valley’s history. Money to offset damage caused by the expansion of interstate power lines allowed the park and its three associated federally recognized tribes to create a summer camp for teens from the Delaware Nation and Delaware Tribe of Indians, now in Oklahoma, and the Stockbridge-Munsee Community of Mohican Indians of Wisconsin. The camp will be held for the second time this summer. For Mr. Owens, whose profession requires him to take a long view of human history, the campers’ interest in the area secures a future for a cultural past that is not quite contained by charred seeds and sifted soil. “This gives it life,” he said.